What happened to those young people that believed in the promise of freedom? Did the Soviet Union meet the hopes of those who fled east to escape persecution at home? Ilja, Klara and Lavr have left their home country for the realm of freedom, vowing never to return. They have changed their names and language; they have left everything behind. In Petrograd a person is who they say they are. Everything is undergoing change and changing everything is the highest goal for these young people. They build families and extended families for themselves from among their comrades. They grow attached to the city, though it doesn’t respond to their affection. The roads and streets are crowded with homeless children. Klara starts to work at a shelter, rescuing those she can. But when Petrograd becomes Leningrad, life becomes too dangerous for the young girl whose roots arouse suspicion. 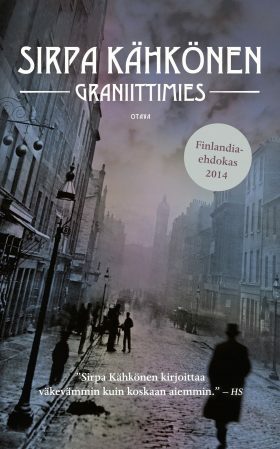 Granite man is a lovely, wistful and mysterious novel that stays in mind for a long time. Tragic and exciting, wonderfully written. The main character of this book is also St Petersburg, aka Petrograd, aka Leningrad, in which the street kids affected by the mistreatments of Communism try to survive amid the dirty waters of the sewers.